Posted on August 21, 2010	by Lou Murray, Ph.D.
It’s Friday and I’ve already harvested over nine pounds of produce from my three little raised beds and the Smart Pots in the driveway. This is shaping up to be a record harvest week. Of course it’s mostly tomatoes and green beans, but there’s nothing to complain about there. Another day, another bunch of tomatoes. As I was making a big pot of spaghetti sauce last night, I couldn’t help but think of Thomas at A Growing Tradition, Daphne’s Dandelions, and Annie’s Granny and their incredibly large tomato harvests. Annie’s Granny harvested a whopping 80 lbs of tomatoes last week. I, on the other hand, had just enough leftover sauce to freeze two cups for winter use. 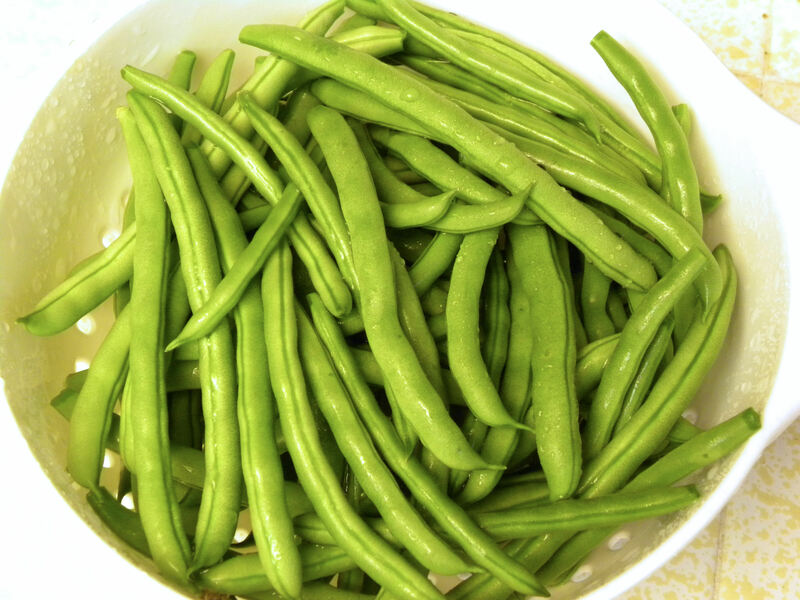 I’m planning on freezing some green beans today, since I picked 1 lb 6 oz this morning and still had beans in the crisper. My wise-guy husband has caught on to the fact that we’re getting record numbers (for us) of tomatoes. After Huevos Rancheros for breakfast and salad Nicoise for lunch, he asked how we’re having our tomatoes for dinner. Last night it was spaghetti with Italian sausage and marinara sauce. Tonight it will be penne pasta with eggplant and Italian sausage with marinara sauce. And by then another batch of tomatoes will have ripened and I’ll make some gazpacho. All I need is 2/3 lb more produce this week and I’ll have topped 10 lbs for the first time. And that’s without any squash! I think I’ll be able to find 2/3 lb of produce somewhere in there. 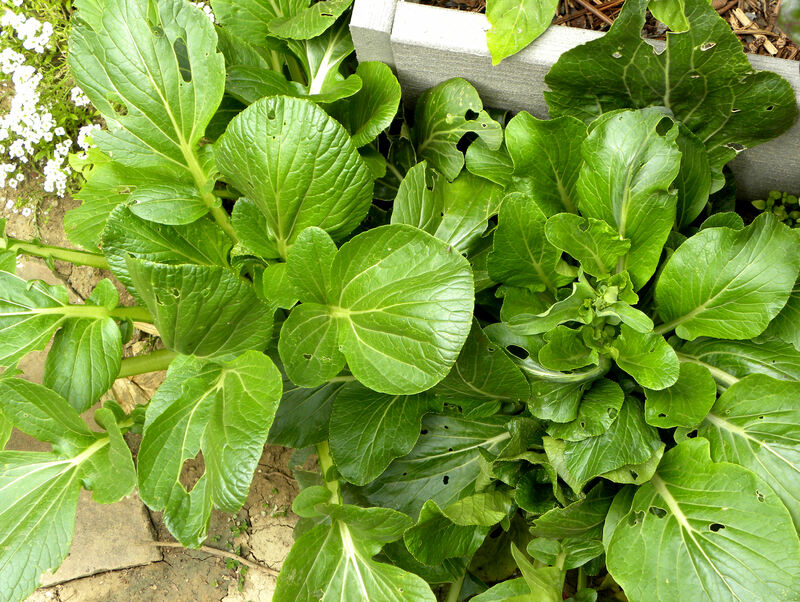 I could pick some komatsuna for a stir-fry. Or I could harvest the two ripe Tendergreen cucumbers and a couple of bell peppers for gazpacho. And I’m sure that by Sunday I’ll have more green beans and tomatoes. Woohoo, record harvest, here I come. My Blue Lake pole green beans are producing a LOT of beans this summer. Yesterday's tomato harvest included my second Black Krim of the season. This entry was posted in Uncategorized and tagged green beans, Kitazawa Seed Company, Komatsuna, tomatoes, vegetable garden. Bookmark the permalink. 11 Responses to Heading for a record harvest week! 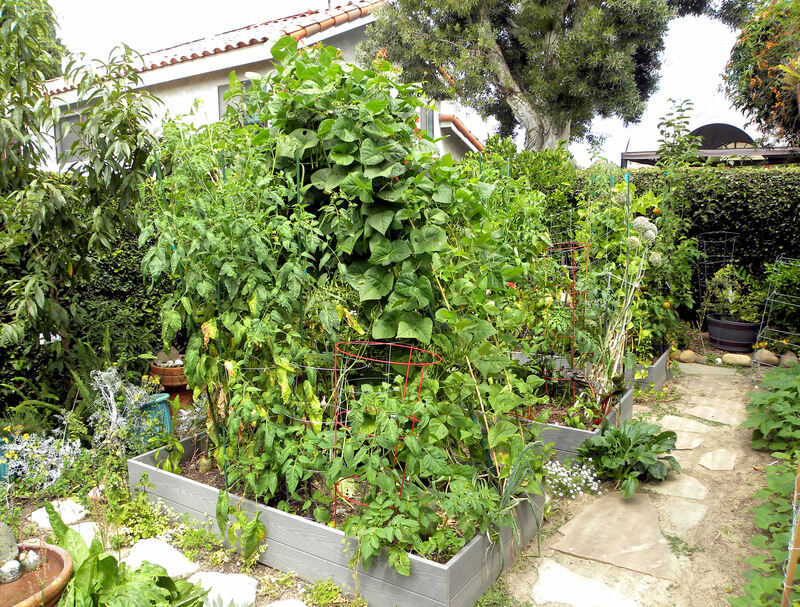 Mostly green beans and tomatoes in this SE section of Huntington Beach, too. I think I over-planted the beans, because last year we had harvested almost none! Three tomato plants are producing: a determinate Better Bush, which has come into its own this last week, a volunteer “cherry” tomato which has, in its indeterminate way, taken over the garden, and a Health Kick, which has two green tomatoes, though it ought to be resting right now! Like you, I’m going to be freezing some beans – maybe tomato sauce, too! And next year, I’m planting just determinate varieties of tomato!!! Hey, Kathy, sounds like a great harvest for you too. Bangchik, good to hear from you. I think of you every time I look at my ginger plant. I’m looking forward to a ginger harvest later this year. Yeah, Clare, 80 lbs of tomatoes in one week just doesn’t seem fair, does it? 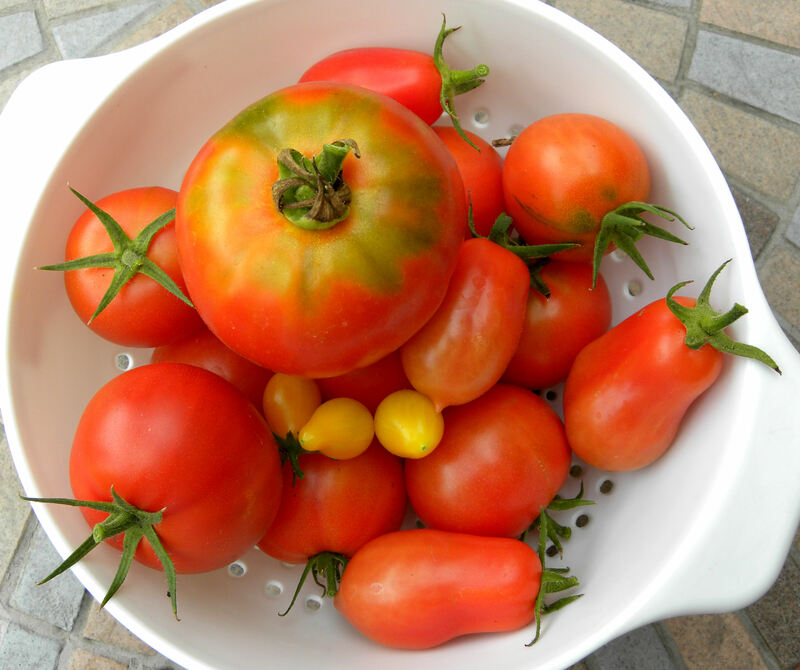 Good luck getting warm enough weather to ripen your tomatoes. It finally turned hot here this week. Go tomatoes! I usually get a nice counter of tomatoes, but I can’t touch Thomas’s or Granny’s harvests. I only have 12 plants. I think Granny planted 50 and Thomas about 40 or so. They are crazy people. I couldn’t keep up with that many tomatoes. Though I’m thinking about 16 next year. Then again, maybe I’m crazy too. Your breakfast looks fabulous. I love Huevos Rancheros. Aha, thanks for letting us in on Granny’s and Thomas’ secret. No wonder they get such a huge harvest. I don’t want that many tomatoes. I have 19 tomato plants, but only four of them are producing much. Some of them, the Brandywines and Mortgage Lifters, haven’t produced a single ripe tomato yet. But they have nice big green ones, so it’s only a matter of time. I hope to have a long harvest season. 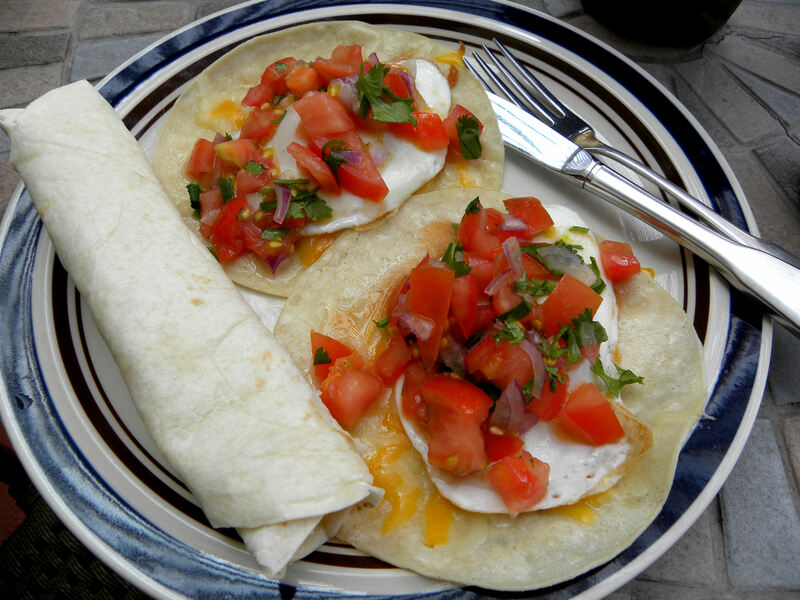 Congrats on your big harvest, the huevos rancheros look delish. 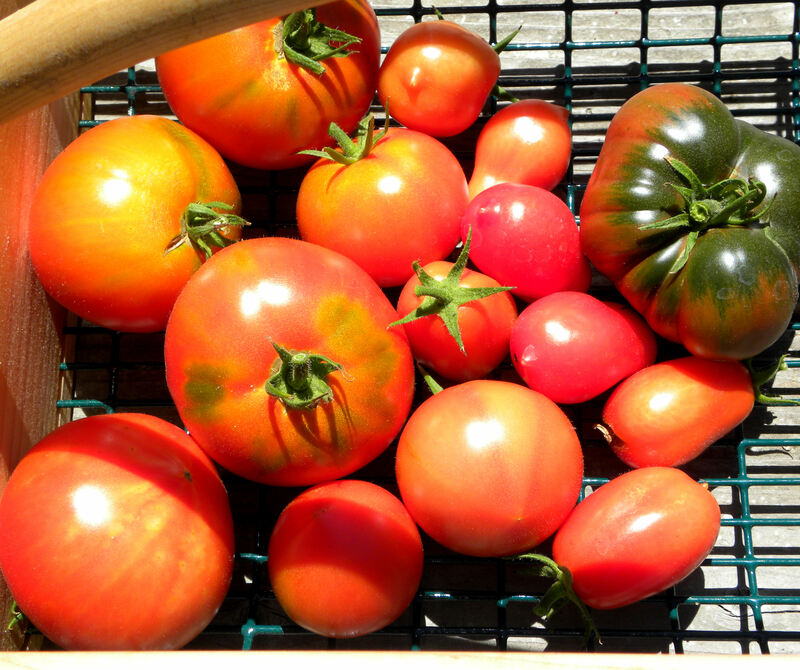 I only have 6 tomatoes plants–1 paste, 3 slicers, and 2 cherries, that’s enough for the 2 of us. I’m not into canning, I just discovered how easy it is to make roasted tomato sauce in the oven, and I made 3 trays of that last night, roasting the tomatoes seems to bring out the best of tomato taste, and it is easier for me to do it in small batches and freeze the sauce. I haven’t tried making sauce by roasting the tomatoes. Sounds good, Mac. Your lovely harvest makes up in quality what it may lack in quantity. I wish I had half of what I have coming in right now, and I’m going to really concentrate on planting less next year. I think I said that last year, but I really mean it now. Really, I do.